Our Solar Panel Cleaning service helps you protect your investment in solar technology. Dirty panels will produce reduced electricity output so clean them! Many businesses and home owners have invested in green solar technology. Whether you are looking to reduce your electrical costs or provide additional revenue streams; the additional of solar panels will have been a business one based on a return on investment over a number of years. Many of the figures and expected returns will be based on a percentage output of your solar panels. Dirty solar panels will be receiving less sun light; therefore they will be less efficient and produce less electricity! 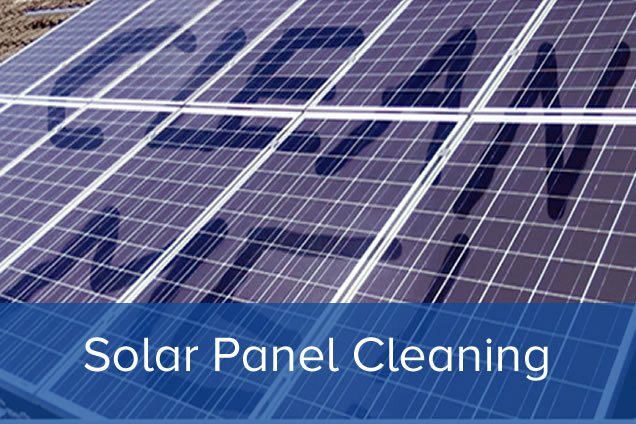 Our Solar Panel cleaning can either be a one off, or a regular contract cleaning schedule. Many clients favour a pre-summer and post Autumn clean to ensure the brighter, sunnier days of both summer and winter can provide maximum electricity generation. Another reason for a minimum bi-annual clean is the warranty small print on your panels – in many cases they state the panels must be kept clean! We use our unique reach and wash system that uses scientifically produced pure and soft water via a RO (Reverse Osmosis) process!